According to the World Bank, 4 out of every 10 young Latin Americans desire to become entrepreneurs - and the region is taking notice. Whether in the “Chilecon Valley” or the government-backed accelerators of Buenos Aires, innovation hubs are popping up across the region and developing a culture of creativity and entrepreneurship. 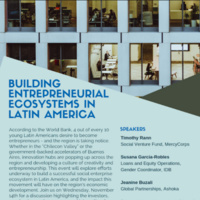 "Building Entrepreneurial Ecosystems in Latin America" will explore efforts underway to build a successful social enterprise ecosystem in Latin America, and the impact this movement will have on the region's economic development. Join us on Wednesday, November 14th for a panel discussion highlighting the investors, accelerators, entrepreneurs and international organizations shaping this new business landscape. We will be joined by representatives from Mercy Corps Social Ventures, Ashoka and the Inter-American Development Bank. This event is brought to you by the School of Foreign Service Net Impact Chapter, the Global Human Development Program, and the Center for Latin American Studies. Space is limited. Light refreshments to be served.